The Delicious One makes your high-end system sound delicious (i.e., smooth, rich, warm, relaxing) even at lower volumes or when playing harsh or thin-sounding recordings. The Delicious One started life with an idea for an auxiliary variable loudness control. But once we started experimenting with various circuits we got carried away and set out to design a single-knob tone control that could also work to take the edge off some harsh records and add body to lean sounding ones. We won't name names, but it's a sad fact that some great music was poorly recorded, mixed and/or mastered, while some of the best sounding audiophile-quality recordings come with music or performances that are, let's say, not very compelling. If you have ever cringed when playing some of your favorite music on your high-end system because it revealed a bit too much, The Delicious One might just be the answer. What does The Delicious One it look like? The Delicious One works like no other audiophile component and looks like no other audiophile component. We've hit upon an unique "form follows function" industrial design whose most striking feature is one, big, heavy-weight, knob machined from solid aluminum. One knob. One bypass switch. That's it. The Delicious One started as a modern interpretation of the classic and much loved (at least by some) variable loudness control you'd find in top-of-the-line (McIntosh, Marantz, Fisher) receivers and amplifiers of the 50s, 60s and 70s. But in the process of designing and experimenting we hit on a combination of design and functionality that makes The Delicious One much more than just a sonic aid for low-level listening. The big honkin' knob to make every listening session as delicious-sounding as possible. We believe that you won't be able to take your hands off it. It turns out that the tone control circuit we designed not only works great for low-level listening, but it also helps to make some harsh recordings (especially digital ones) sound less fatiguing and more enjoyable. It also adds body and deliciousness to lean sounding records. See videos for more on this. The more we used it, the more we realized that The Delicious One is truly unique and we've become totally addicted to it. A lot of records whose music we loved but seldom listened to because they did not sound very good (harsh, thin, edgy) are now back in regular rotation; as music lovers we could not ask for more. Because of this, we've labeled the big knob Deliciousness Control. What's with the big knob? Even though the big knob (~2.5") looks cool and give The Delicious One a unique look, it's a case of form following function–as our early users and testers have found out. A large-diameter knob allows you to make much finer adjustment than a small one, it helps you dial in just the right amount of deliciousness for your tastes. The cool and unique look is a bonus. Sounds great. I have a preamp without any tone controls and really miss them. How do I insert The Delicious One? 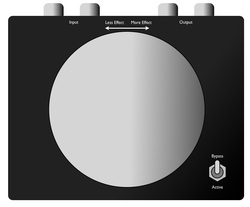 The Delicious One accepts line-level input and provides line-level outputs. If you have a preamplifier and would like to use it with all the sources you have, we recommend Configuration 1 (see figure below.) Alternatively, you can connect it to the output of an line-level device (CD player, DAC, phono stage, tuner, iPod, etc), see Configuration 2. How much does The Delicious One cost? Currently, we are building and offering the hand-made, individually numbered, Signature Edition of The Delicious One, priced at $695. Each Signature Edition unit is hand-made in California, one at a time, with point-to-point wiring and high-quality, carefully chosen and individually matched and tested components (e.g. Cardas RCAs). The 2.5" diameter Deliciousness Knob is a custom part machined from a solid piece of high-grade aluminum, then polished and anodized (our cost is $35 for each knob.) After assembly, the internal components are potted with two different compounds to minimize any vibrations and resonances–things many audiophiles care about. Each unit is then tested and verified by our Chief Toneologist and designer, Alberto, both by ear and with audio analyzers, and the customer gets a signed copy of the test results for their unit. From beginning to end, it takes over 6 hours of manual labor to complete each unit; and the final product weights a hefty and satisfying ~2.5lbs. Here are some comments on the build quality from some of our early customers: "I just opened the box to look and it's everything I was expecting and more ... The craftsmanship is readily apparent in the look and feel of the device. Very nice ... My impression of the physical shape and size is very positive ... The weight is just right ... The quality of the input and output RCA connectors is excellent ... The control knob is a perfect size that allows an adult hand something substantial to grasp while making adjustments." For the price of a high-quality interconnect cable, you get a device that, according to several users, is like getting a new system; one that will maximize your enjoyment with many harsh/lean recordings and in any listening situation where you would like your system to sound warmer, more relaxed and forgiving. And, unlike most audiophile cable purchases, you will have no trouble at all hearing a difference–a delicious difference–unless you hit the bypass switch, in which case we dare you to tell any difference because The Delicious One is designed (and tested) to be completely transparent when bypassed. OK, now you got me all hot and bothered. I would love my system to sound more delicious at lower volumes and with some lean or harsh recordings. Where can I get one? We are currently in initial launch mode, so our supply of The Delicious One Signature Edition is limited. If you are seriously interested, use the contact page and we'll update you on availability.